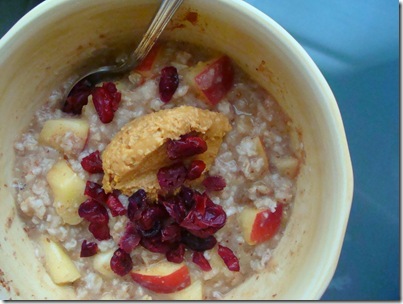 I was CRAVING some oats this morning – thanks bloggers! I swear everyone had oats today, so I jumped on the band wagon. 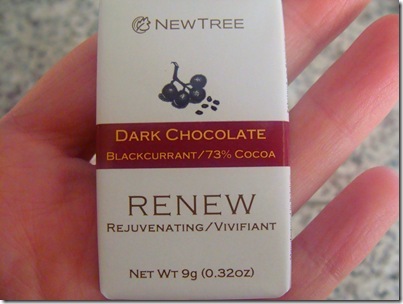 Dessert – currant’s are so delicate! 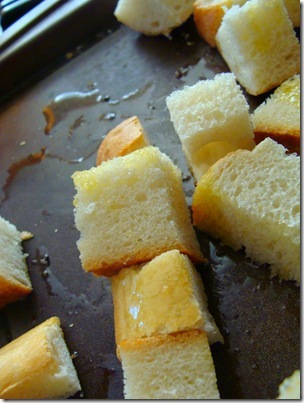 I also made some homemade croutons from a half of a French baguette – they turned out beautifully! I will post the recipe below. J and I made yet another trip to the fabric store. I swear it’s like being in a candy store for me. They were having a HUGE sale on children’s flannel so I have some fun projects coming up! 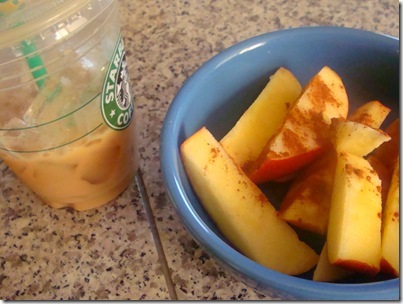 I stopped by Starbucks and picked up a soy chai latte, then came home and had an apple with cinnamon. 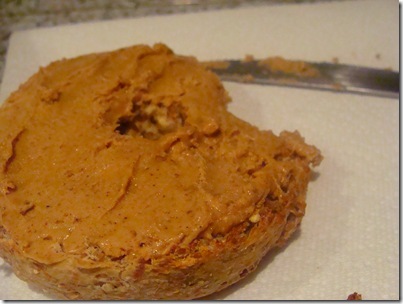 I was looking forward some gym time tonight so I quickly at a half of a sprouted bagel with some almond butter on it – this was a great pre-workout snack! I did 4.5 miles in 46 minutes including a 4 minute warm up, and I did some interval work on the stairs at level 15! I cannot believe how strong my legs are! Level 15 is INTENSE and pretty dang hard. Way to go legs! I was watching The Biggest Loser at the gym, too. I would LOVE to train with the Olympians! I made sure I got home before the very end. 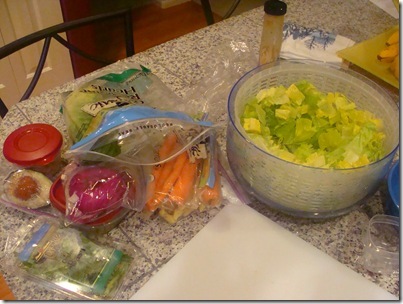 I quickly emptied out my veggie drawer and started chopping. I was craving a huge salad so a HUGE salad I got! Believe me, it tasted much better than the picture! 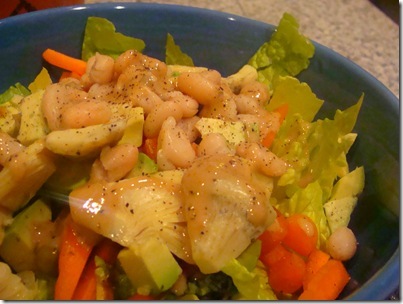 Romaine + basil + carrots + avocado + artichoke hearts + great northern beans + peas + red onion + Amy’s Goddess Dressing + black pepper. I noticed that I had a pretty carby day today so this was a great balance to end the day. Any one surprised the Mellissa went home? I cannot understand how she has managed to have 3 BAD weeks! First it was +1, then it was –1, then tonight it was another +1. How? 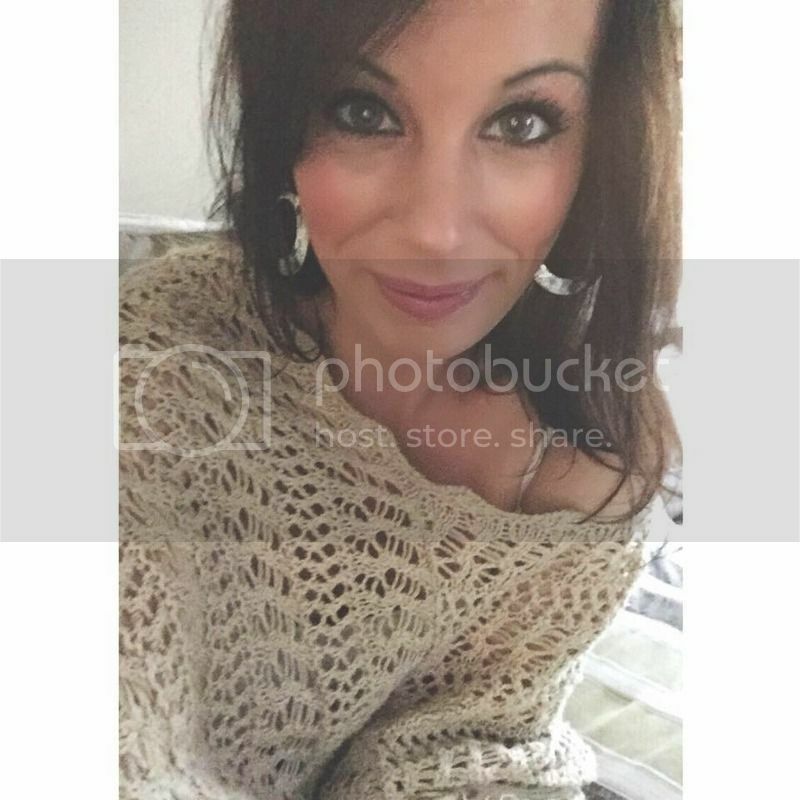 Although I must admit she looks great in her comparison picture that they showed at the end; but I still do not understand! Preheat oven to 400 degrees. Cut the bread into bite size cubes. It’s easiest to take all of the bread pieces and put in a large bowl, drizzle oil to coat and toss with your hands. 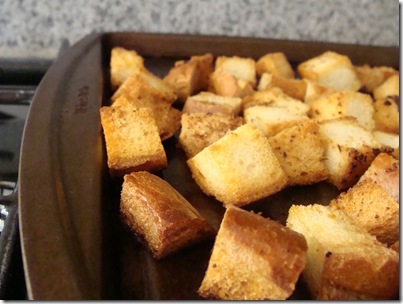 Put the croutons on a cookie sheet, sprinkle your seasoning(s) of choice on them and back for 10 minutes. 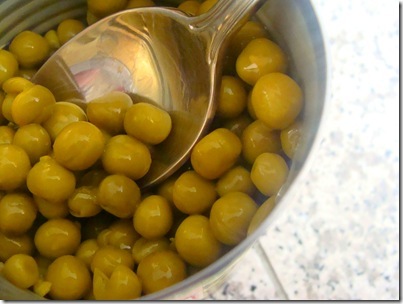 They should be hard and golden brown – cool and enjoy! 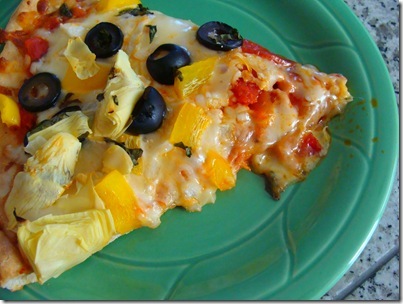 This entry was posted in breakfast, dinner, lunch, recipe, workout. Bookmark the permalink. 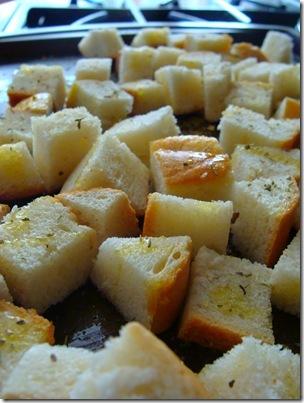 Now I am craving croutons! Those look SO good Tash! Nice to find someone in the pacific north west! I'm just two hours north of you- Victoria, BC! Love your blog- looking forward to seeing more! hey! i just found your blog from janetha's and I love it!! i can't wait to read more 🙂 have you tried janetha's yoats creation?? it's hot oats mixed with greek yogurt and i love mixing it with peanut butter.. sooo good!! That looks delicious! My diet is very similar to yours. I love cranberries in oatmeal. I always use steel cut oats. I LOVE homemade croutons! My mom makes the best croutons ever and she used to send me bags of those in college in lieu of cookies! I hate boxed croutons, but those look FABULOUS! And easy! Thanks for the recipe!! I've got to make some homemade croutons. 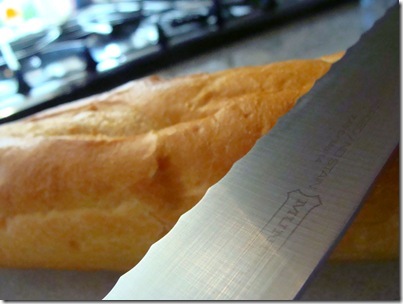 I didn't know it was just french bread lol! homemade croutons are a huge favorite at our house…plus, it's nice to know that they're baked and not doused in oil or fried! 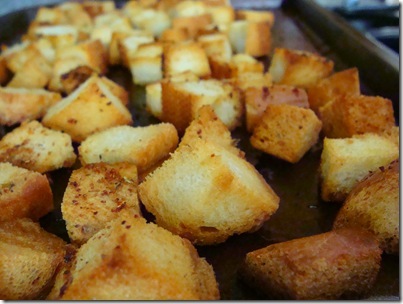 Homemade croutons…what a great idea. The store bought ones are so full of junk! This is a much better idea.